Riding a bicycle is a healthy and environmentally friendly way to commute to work, run errands, or just enjoy a warm day, in middle Tennessee but it can also be a dangerous activity—especially when other people on the roadway fail to watch for the presence of bicyclists. 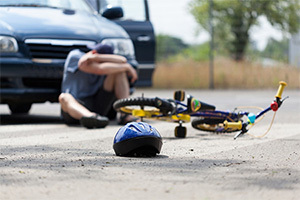 If your favorite pastime or your eco-friendly way to work has turned into a nightmare due to someone else’s negligence you need the guidance of an experienced Nashville Bicycle Accidents Lawyer. Because bicyclists lack protection beyond basic life-saving equipment like helmets, even minor accidents can result in serious injuries. And while the property damage that bicyclists incur after an accident is relatively minor, the pain and suffering can be much more debilitating and cause them to miss weeks, months, or even years of work—all while facing expensive medical bills and extensive rehabilitation. Whether a bicyclist is crossing a street or making a turn, situations, where he’s no longer riding in a straight line with the flow of traffic, are situations when he or she is the most vulnerable to accidents. Because drivers scan their vision for street signs, traffic lights, and other vehicles, they rarely look for bicyclists unless they are directly in front of them. That means bicyclists who are turning or crossing the road may be overlooked by drivers and struck by their vehicles. Many cities throughout Middle Tennessee have lanes designated specifically for bicyclists. While those lanes are great for reducing the risk that bicyclists face, they don’t eliminate it completely. When riding alongside a vehicle, bicyclists can be seriously injured if the vehicle drifts towards the bike lane even momentarily. All it takes is a slight shift in direction for one or two seconds for a vehicle to force a bicyclist off the road or collide with the bicyclist. Reach out to our team if you’ve had a motorist drift into your bike lane, causing personal injury and damages. Stop signs and red lights are vital not only to direct the flow of traffic at intersections, but also to protect pedestrians, bicyclists, and motorists themselves. However, because drivers are generally used to scanning the environment at intersections for vehicles and pedestrians, they may overlook the presence of bicyclists. In addition, some drivers who think the coast is clear may run stop signs and red lights without slowing down, putting bicyclists at risk of being involved in serious accidents. It is important to know and understand the most up-to-date Tennessee Bicycle Laws. The fault for bicycle accidents doesn’t always belong to the driver. In fact, many bicycle accidents are caused by negligent behavior on the part of the bicyclists themselves. To stay safe, bicyclists should always signal their intentions at intersections by using hand signals to show that they are turning or stopping. In addition, bicyclists should ride in a smooth, predictable pattern without zigzagging, drifting between vehicles, or cutting sharply in front of vehicles while in traffic. Bicycle safety requires the vigilance and caution of everyone who shares the road in Tennessee. If everyone is aware of the presence of bicyclists—especially in residential and urban areas where bicyclists are more common—the risks that bicyclists face on a daily basis can be reduced significantly. If you or someone you love was injured in a bicycle accident caused by a driver’s negligence, you may be eligible for compensation for things like medical bills and lost wages. To find out how our Nashville Personal Injury Attorneys can help you, just dial (615) 200-1111 or fill out a free online form. Matt Hardin and his team of compassionate and capable attorneys fight for injured victims. Matt Hardin Law’s legal team represent bicycle accident victims throughout the Volunteer State, including Nashville, Memphis, Cookeville, Clarksville, Lebanon, Murfreesboro, and more.